With Instagram being one of the top social media platforms, and quickly surpassing the monthly and yearly growth of Facebook, it’s easy for brands to invest a significant amount of time and energy into crafting beautiful visuals. However, while design is fun (and important), it’s vital to focus just as much time on the other key communicators of your brand: words. Copy exists everywhere: online, in print, and in your actual brick-and-mortar location. Whether someone is picking up a pamphlet or reading a social media post, your potential client needs to be able to capture your character and personality through your words, which is why having a developed brand voice is so crucial. What is a brand voice and why do I need one? Your brand voice (sometimes called your brand lexicon or phraseology) is a combination of your brand's tone and choice of words. It includes both what you want to say and what you don't want to say, and it also encompasses your overall point of view. For example, do you speak from a place of authority? Or are you speaking from a position of kinship, where you are walking alongside your audience? Ultimately, your brand voice is the foundation of all marketing, and a well-defined brand voice shows your client that you’re speaking directly to them. A brand voice that resonates is one that uses language that resonates with your ideal client and by aligning with their personal style and sense of humor. In addition to attracting the right people and authentically appealing to them through your brand’s personality, your brand voice will also turn away the people who aren’t the best fit for you or your business. Finally, your brand voice helps you remain consistent across all platforms. When you utilize a consistent voice on your website, social media profiles, email copy, etc., it breeds trust and lets your clients know exactly what they can expect. How do I talk and connect with people? How do I create a safe space for them to really open up? What are some of the phrases that I use that people find funny or connect with by mirroring it back to me? What are words or phrases that my ideal client uses? These questions should help you identify words that are true to your brand. As you answer these questions you’ll want to pull specific words and guidelines out to develop your unique brand dictionary, but remember, authenticity is key here. Don’t throw in buzzwords or slang for the sake of sounding trendy (unless you actually use those words). Develop your voice in a way that mirrors how you communicate in person. Once you have your brand voice developed, learning when and where to use it is pretty easy… your brand voice should be used everywhere and all the time! That means it's on all digital fronts, all printed collateral, in your studio, in your salon or in your spa - every single touch point of your brand experience should have your brand voice attached to it. Even something like your cancellation policy or your treatment terms and agreements, those should have a touch of your brand voice in them. Just because something is formal doesn't mean it isn’t included in your brand experience. So, what does it look like to master your brand voice? 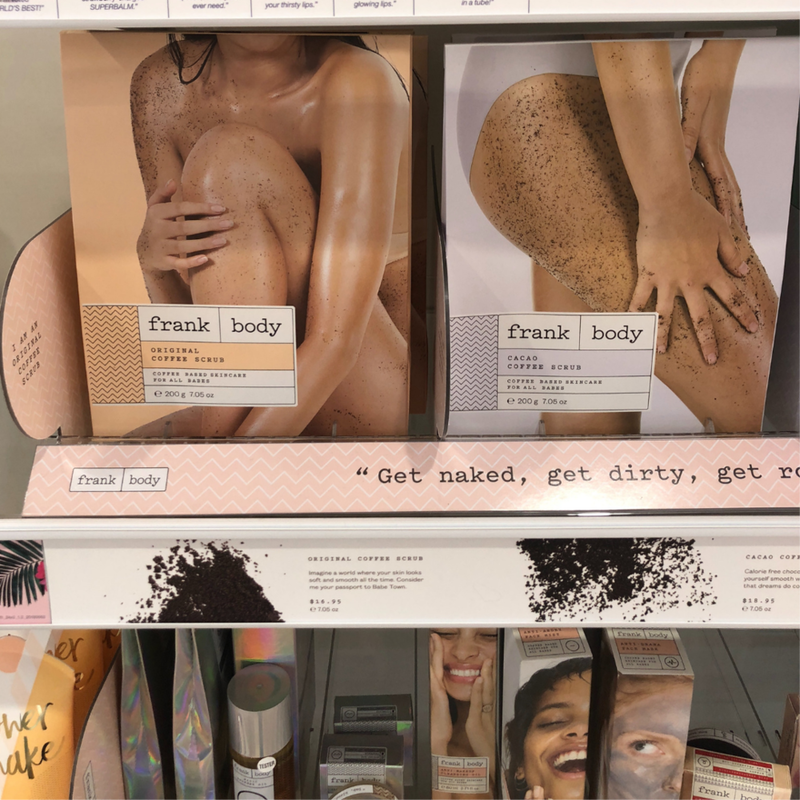 Frank Body — This is an Australian brand that creates skin care and beauty products, but they’re most popular for their coffee scrub. Obviously, not every brand can pull this off, but it is a great example of how you can take a different approach with your brand voice. Gloss Goods — This is a small, boutique beauty shop in my neighborhood in Florida that has developed a brand voice that is more peer-to-peer rather than expert to consumer. If I think of the Gloss Goods brand persona, she is your bestie who knows all the best beauty finds. If you're looking for the perfect mascara, or the perfect all-natural facial mask, or a really cool CBD beauty product, she's your go-to girl, and that’s born out of their brand voice. Nancy Anderson Fitness — Nancy is a nutrition coach and personal trainer who specializes in pregnancy and postpartum fitness and nutrition. Her brand voice is very much what you would expect from a personal trainer, a little bit of tough love mixed with an energetic cheerleader. Like Gloss Goods, she takes a peer-to-peer approach by talking about her experience as a mother - she has done this before, she knows you can do it. However, she also mixes in expert language to convey her position as an authority on her topic. She’s an excellent example of how you can use varying perspectives when developing your brand voice and how you can utilize brand voice as a personal brand. Have questions about how to shape and develop your brand voice to draw in more of your dreamy clients? Leave a comment below and share a brand whose voice does a great job of capturing your attention!